There is no gauge on Lion Creek, but the Pack River and Boundary Creek guages can provide an indication of what's going on with flows. 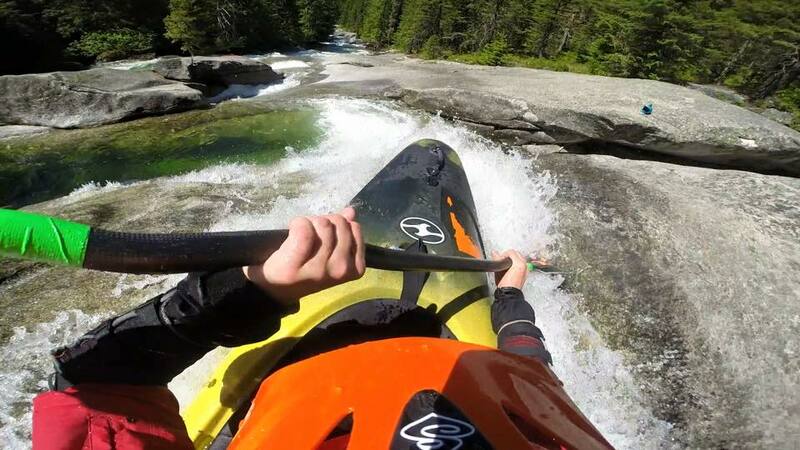 Most people will want to make their first run at very low flows, with some one familiar with the run. Lion Creek is a short 1.5 mile, hike-and-huck run over a series of very steep, very big, granite slides and ledges. The take out is at the parking area at the end of Lion Creek road. Boaters new to the creek should mark the take out with surveyors ribbon as it can be hard to spot from river level. Plus, just below here is a dangerous steep section of canyon. To get to the put in, hike upstream around a mile and half to where the trail fords the creek near the confluence with Kent Creek. Note that it is possible to bushwack a short distance above the ford on river right for a bonus slide. Just below Kent Creek is a major drop on a series of bends. Stop above the first section of small entrance slides on river left to scout the whole section. The drop has been run, but it may be most frequently portaged. From below here is another long, steep section that ends in a meadow where the creek flattens and pools up. The pool runs out into a class III rapid, leading into a major horizon line with two large back to back drops. Scout the first drop left and portage right. set safety between the drops. The first drop goes left, the second right. After another pool is a big slide where the river splits into two channels; scout, portage and run right. At low flows, it is helpful here to have someone hold boaters at the top of the drop as they get lined up, then release them as they drop in. Below here is one more signicant drop, followed by a class III-IV run out down to the take out. Again, don't miss the take out as the creek drops into a very steep and dangerous section below. Lion Creek drains off the West side of the Selkirk Crest into the northeast end of Priest Lake. From the the town of Priest River, take hiway 57 North 26 miles to Dickensheet Hiway. Head East (right) onto Dickensheet Hiway and continue 24 miles to nothern edge of the Lion's Head State Park Unit. Continue up Lion Creek road, on the North side of Lion Creek, till it ends (approximately 5 miles). Park in the parking area and hike another 1.5 miles up the trail / primitive road to the put in.